Riviera Maya, Mexico (June 22, 2010) — Grand Velas All Suites & Spa Resort Riviera Maya was honored with the 2010 WAVE Award in the category of “Best All-Inclusive Resort, Mexico” on June 10 in Beverly Hills as part of the TravelAge West WAVE (Western Agents’ Votes of Excellence) Awards. The award was presented to Fernando Garcia Rossette, Grand Velas Riviera Maya’s Managing Director, by TravelAge West Publisher Michelle Rosenberg during the 2010 WAVE Awards Gala held at the Four Seasons Hotel. “We are very proud to be recognized as the Best All Inclusive Resort by our colleagues in the travel industry and by one of the top trade publications in the U.S.,” said Garcia Rossette. More than 125 companies, individuals and destinations were celebrated by the readers of TravelAge West at the WAVE Awards ceremony. Honorees were recognized in 47 categories that spanned the cruise, tour operator, airline, hotel and resort and destination travel fields. The awards gave travel agents in the Western U.S. the opportunity to recognize the outstanding qualities and services of their travel supplier partners. Grand Velas All Suites & Spa Resort Riviera Maya represents the latest and most sophisticated iteration of the ultra-luxury, all-inclusive resort experience. Building on the success of its AAA 5-Diamond-ranked sister property in Nuevo Vallarta, this Leading Hotels of the World designated resort is the preeminent one of its class boasting 491 suites, each more than 1,000 square-feet, in three separate ambiances– adult-only ocean-front and ocean-view Ambassador Grand Class Suites, family-friendly Ambassador Suites and Master Suites embraced by the flora and fauna of the Yucatan Peninsula’s jungle. The resort presents a gastronomic tour of the Yucatan, Europe and Asia offering seven restaurants with world-class chefs from France, Spain and Mexico; the region’s largest spa sanctuary at more-than 89,000 square-feet specializing in signature treatments inspired by ancient cultures from around the world; dedicated butler service for each guest and a 91,457 square-foot convention center ideal for business and social gatherings of all sizes, including weddings. The resort was designed by lauded Mexican architecture firm Elias and Elias and features the sleek and modish interiors that fuse the serenity of the Caribbean with the vibrancy of Yucatan cultures. The resort is 40 miles from Cancun International Airport and five minutes from Playa del Carmen. 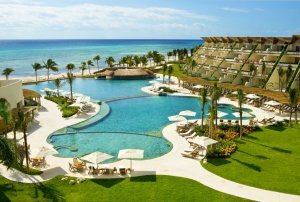 For more information on Mexico’s most refined Caribbean sojourn, visit www.grandvelas.com. TravelAge West (www.travelagewest.com) has been serving the travel industry for over 40 years as a leading source of travel industry news and product information. Read by travel agents, travel suppliers and travel industry professionals, the publication has a circulation of 22,000 in 14 Western United States.